The Place I was thinking of a restaurant for a celebratory occasion and I thought of Corner House, a One-Michelin starred restaurant located in a colonial and preserved bungalow in Botanical Gardens. The UNESCO Heritage Site is huge, and it can be confusing for first timers in terms of directions to the restaurant. If you are driving, park at Nassim Gate entrance and head to carpark A, from which the restaurant is merely 3 minutes walk away. I did my research about the space and requested for the air-conditioned seating at the Verandah, which is surrounded by the lush greenery of the garden. The greenery and space really makes the dining experience a little more special, if I were to compare it to the indoor seats which look like any other restaurant. The Food It was my first visit to Corner House so I was really excited and probably a little regret is that I am not trying the dinner menu for the full experience but went for the Sunday Brunch instead. Available at S$98++ Per Person, the Sunday Brunch set is a 4-course meal affair. The meal started with some complimentary Freshly Baked Croissant and Bread, along with Yuzu and unsalted butter made from French Bordier butter. This must be one of the most amazing croissant I had! It is divine with the amazing Yuzu butter, after which I have to top up both the croissant and Yuzu butter which the service staff obliged happily. The first course is an Assiette of appetisers such as Cherry tomatoes with Sakura ebi and Goma sauce, Luncheon meat croquet with mango, Foie gras with chrysanthemum and crispy bread, as well as Cod fish tartare. The portions are generous, though I wouldn’t say any particular appetiser stands out for me. It is a good variety at the very least. The second course is a choice of an egg dish, and I managed to try both the Corner House Eggs Benedict with smoked salmon and my partner’s 62 Degrees Farm Egg served with duck confit and Jerusalem artichoke. Go for the latter if you can only choose one as the flavours are more well-rounded. The third and last savoury course is a choice between the Free Range Chicken with chicken breast and thigh, mushrooms and Manjimup black truffle, or the New Caledonia Obsiblue Prawn. My preference between the two is the prawn risotto with bottarga, where the grains are cooked to a nice and firm texture along with the rich flavour of the Obsiblue prawns. For dessert, it is a refreshing Soursop of watermelon, rose and rambutan. Rants With public transport, it takes some good walking through the gardens to reach the restaurant. The Verandah section aside, I wasn’t very impressed by the interior dining sections which makes it a pretty normal dining ambience like any other restaurants. Will I Return Again? Corner House is a restaurant to come to my mind if someone asks me for recommendations to celebrate a special occasion as the venue itself is a destination for me. 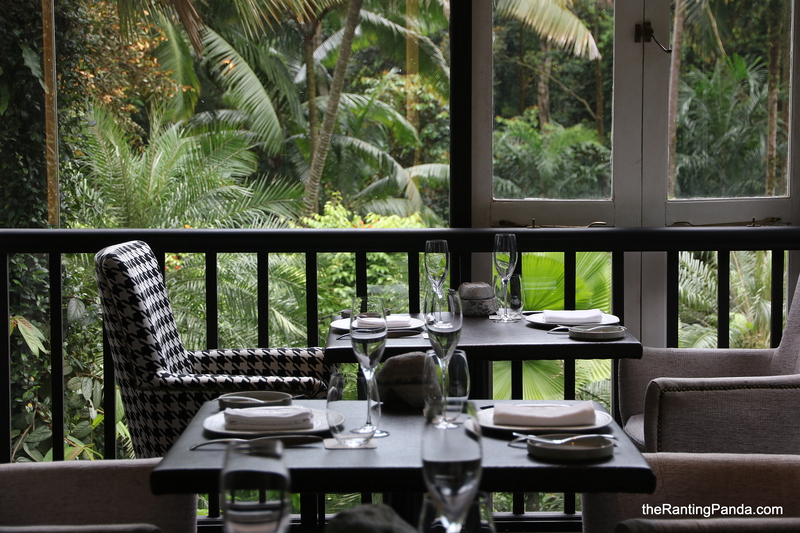 The Verandah section is one of the most beautiful dining setting I have seen in Singapore (the other being the Garden Dome at The Summerhouse), while the food I had at the Sunday brunch is competent, am sure this is not a good representation of Chef Jason’s culinary finesse. Make your reservations instantly at Corner House here.